This module is designed for the management, in construction phase, of viaducts performed with precast segments. Project can be imported directly from archives in csv format without having to manually store the project segments. You can control prefabrication with prefabricated insertion through appropriate input masks or with topographic points import from csv file. Plano – altimetric deviations are immediatly displayed, so you can make appropriate corrections in subsequent prefabrication. 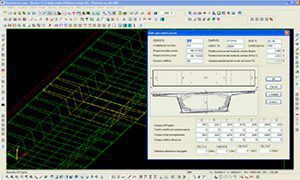 You can also perform the longitudinal profile design of viaducts segments, specifying elevation diffences compared to the project. Is possible to control horizontal and vertical alignment of segments already put in place with respect to the project or prefabrication.